This week in the war, on 22 January 1944, US and British troops landed at Anzio and Nettuno, which were behind the German Gustav Line and well on the way to Rome. The force was under the command of US Army Major General John P. Lucas. The landings caught the Germans by surprise. 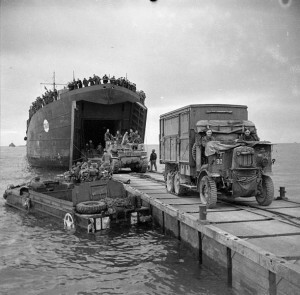 The harbours at Anzio and Nettuno were quickly captured and, within 24 hours, the Allies had landed over 35,000 men. Unfortunately, liberation would have to wait. Lucas failed to press inland. Instead, he waited to bring up his armour and artillery. The German Commander-in-Chief in Italy, Field Marshal Albert Kesselring, quickly reorganized his troops and hemmed in the Allied landing force. The anticipated Allied breakout was no longer possible. This entry was posted in World War II and tagged Anzio, Lucas. Bookmark the permalink.